Looks good, doesn’t it. It’s a Blueberry Smoothie. I experimented a bit with making them (used a “mixed berries” bag, used yogurt out of the fridge, yogurt out of the freezer) but I’ve come to the conclusion that as much as I love raspberries, I do not like their seeds in my smoothie. Blueberries, delightfully, do not have this issue, and after blending them up with some low-fat milk and gorgeously smooth vanilla yogurt, you end up with a fantastically coloured glass full of yum. When it’s 42C outside, I have no desire to eat, so something like a smoothie is a perfect way to make sure I “eat” something for the day. 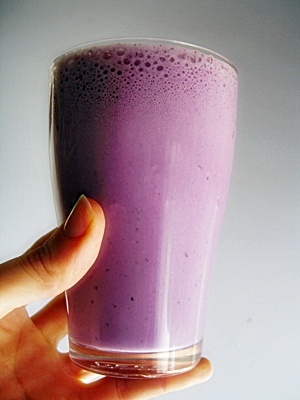 Of course, my way of making this, is to pop in half a bag of blueberries (300gm bag), about 4 tablespoons of vanilla yogurt (or a little tub) and top it up with about a glass or two of milk, then blend. I really should measure everything out next time so you can all make one yourself! Well, I figured out that it was my Airport card in the iBook that was forcing it to Kernal Panic (although we’ve since experience a sad mac file folder on start up at least once) so I am now connected to the net with an ethernet cord! (I need to point out that this failed today too for a short time – sheesh!! LOL) I should also point out that a hardware test failed to provide me for a reason (either the Airport card or the hard drive). We’ve also moved! From a big drafty house up in town, we’ve moved into a smaller apartment nearer the river, but it’s cute and cosy and warmer!! (Big selling point, going into winter.) But I’ve gone from a big pretty empty kitchen to a TINY small cramped space with NO bench space. And my oven doesn’t work, neither does my grill. However this didn’t stop me from making a tasty green bean & cherry tomato casserole, with cauliflower cheese (no bake) and crispy potatoes tonight! Woot for the ingenuity! This meant that we had no internet (again!) for 10 days last week until Tuesday this week. No longer the case though, and we moved to a new provider who seems to provide a much better service, which is all up and up! So that means that it’s time to seriously considering posting again. Hmmm what to choose, what to choose. Follow me on Twitter! Also, pumpkin pasta! Oh, it was so good. There’s nothing quite like it, and I have only one person to thank for introducing me to the wonder of this dish: Mr Bee. It is soo good! salt & pepper + water. Dice or slice up your onion, and dice or slice (into small little slices, you know, just bigger than a dice :D) your bacon. Set it to cook in a nice medium sized pan with a dollop of oil. As that’s cooking away, peel & dice your pumpkin. Make half the dices small and half about twice the size. The reason for this is that you want a nice mushy pumpkin sauce, with some bigger pieces in there. Pop them in the pan with the cooked bacon & onion. Pour enough water over the mixture to just cover, and crumble the stock cube in. Bring to the boil and reduce to a simmer. Cook for (around) 45 minutes until the pumpkin is mushy (or can be mushed up with a bit of movement from a wooden spoon). Make sure that the sauce doesn’t simmer dry, which mine almost did tonight. If it does, just add a bit more water. Season with the salt & pepper. You can add a bit of herbage to it at this point, just to give it a bit of a taste, but I don’t normally. I did tonight, because I added the bit of extra water, and my pumpkin wasn’t a nice rich orange butternut, but an early variety. When the sauce is done, chuck some pasta on and pour over when it’s done. Add some parmesan cheese and munch on down! Is so good!!! Apple iBook woes, or; Large White Brick. Yes it’s been awhile since I did any post here and the reason why is in the subject heading: Apple iBook woes. I bought my iBook G4 in August 2005, from Digilife, in Perth Western Australia, for traveling in Canada. My PC was dying (aka Old) and I wanted a small portable machine. That’s right, I’m a first time MAC user. Pretty much from day one – the problems stated. Month 1: CD/DVD Optical Drive starts glitching in the first 2 weeks. Questioned this with the Apple Reseller, and got brushed off (by Digilife, one of Apple’s Reseller’s in Perth) with severe lack of disinterest. Month 20: Hard Drive Failure. 2 weeks of waiting for replacement part, and 3 weeks before I got my iBook back. Month 24: The Airport Card died. Couldn’t figure it out, until I turned the Airport off, and the computer stopped failing. Month 24: 3 weeks later, (after I dropped it off to Next Byte Melbourne) I got my iBook back, and the same day (the Same Day) the Logic Board failed, resulting in kernal panics, which resulted in MASSIVE panic on my side, since that was my first experience with them. Another 3 weeks in the service department. (Around) Month 30: Replaced my power cord/battery pack, as the cord was frayed. Had been meaning to do this for a while. Month 35: Power connection started blinking at me, going from orange to green. Was concerned about it, and was told by Next Byte Melbourne it would be at least 3-5 working days before anyone would even be able to look at it. Decided to wait for a few weeks. Month 36: Dropped the iBook off to get fixed before the warranty expired. Had the power coupling inside the iBook replaced, the CD/DVD Optical drive replaced (with the comment “yeah, something was definitely wrong with it”), and the Logic Board replaced (again, to which there was no “apparent” reason, but as far as I could tell, the person fixing it must have looked at the record, looked at the logic board, and decided that it needed to be replaced). And yes, another 3 weeks. Month 44: Hard Drive Dies for the 2nd time. No extended warranty left, no funds to fix the iBook, now left with a white brick. How can Apple reasonably expect to retain my business with all these issues? Despite my best efforts, I have been unable to have any communication with Apple and have had the parts replaced reluctantly and with long delays (3+ weeks) by their reseller. I have had maybe that 15 months of Mostly Happy Mac Use, and that’s all. It’s been 44 months. That’s 29 months (almost 2.5. years) of unhappy Mac use. I state the “Unhappy Mac Use” from the first Serious Failure. I have, in vain, looked for an email address to send my complaint to, and explain why there needs to be a Very Good Reason as to why I buy a Macbook, to replace my iBook. Don’t get me wrong: I really like my OS:X operating system. But the hardware that went along with it? Frankly, you can keep it. Please, take it back. I can’t use it, and I can’t afford to get it fixed. My Very First Apple computer. I loved my iPod-Mini. The one product that didn’t survive for very long in the last few years of Mac. I never had issues with it, and only needed the battery replaced after I had it in a Very Hot Summer, and a Very Cold Winter. I loved it so much, I decided to give Apple my business when I needed a laptop. So, we had 5 weeks of no net. Then two weeks ago, around a week after my last post (I figure) and just as I was editing photos, my iBook died. Again. Second hard drive that’s croaked in my iBook (and I am not mentioning EVERYTHING ELSE that’s failed in this sucker). I can’t afford to fix or replace it at the moment, so sadly there is going to be few updates in the near future. How would people feel about simply text-only entries? Where I tell you about the recipe I’ve tried, and post the recipe itself? Boring yes, but I’ll be able to keep the blog going. Good lord, we’ve just suffered (and I don’t use that word lightly) through 5 full weeks without the internet at home. Whilst the local library has a good connection and you can grab an hour at a time (if you get in before everyone else), there was no facility that allowed one to upload anything to the internet, and to be honest, I’ve had other worries on my plate. Poor blog!! I do love you, I promise!! In country news, it’s been a shocker. We’ve had a hot dry summer down on the east coast on Aussie-land, and the state I live in (Victoria) has seen the worst natural disaster in history. We suffered through a day over over 46/47C through the whole state, there were major bushfires in numerous places, and 210 people lost their lives. Whilst the town we live in wasn’t directly affected on ‘Black Saturday’, we had several fires in the surrounding areas, and the communities east of our town were on evaucation alert due to one of the bigger fires in the state. (Not one of the major ones where people lost their lives, and let me tell you – there are some towns now that don’t exist.) However thanksfully around the start of March, we got hit with an ‘on-time’ blast of Autumn and the weather has slipped into the Autumn pattern of still warm days, overcast skies, and cooler nights. The town is full of trees that change with the season, and it’s gorgeous to see. Some trees are turning from green to gold/yellow, and others are skipping yellow and going straight for the red! It will only get better over the next few weeks I’m thinking. So, it’s time to find all my photos over the year so far, and upload some stuff for everyone! Well, I kept to my word and made a potato dish for dinner. It was VERY good! I made a “Cheesy potato bake”, based on a recipe I’d seen on http://www.taste.com.au, but modifying it to my own wants. It called for a white sauce to be poured over the potatoes instead of cream, or sour cream, and baked. I par-boiled the thinly sliced potatoes I’d made, then set them aside to cool while I made the white sauce. Put in the pan, sprinkled the flour & made a roux. Started to add the milk and paused in the middle to add salt, pepper & smokey paprika. Added the rest of the milk and let it come to the boil. I grated some cheese, added, stirred the sauce, then let it gently simmer, giving it a whisk every now and then. I started to layer the potato in the dish, making one layer then adding some torn up slices of ham, pouring a few ladles of the white sauce over, and then repeating. Then I grated some more cheese over it and sprinkled generously with breadcrumbs. Into the oven whilst I went and bought some greens, and finished off the herb’ed bread I was making.